So you know what are really cool? Buffalo. Buffalo are awesome. A few months ago however, I got charged by a big buffalo. It was both terrifying and fascinating, yes, fascinating. Thankfully quick thinking kept me out of a potential search-and-rescue call. (While they are technically bison, the term buffalo is also used in today's culture so I'll be dishing out this post using both words). This past fall I made a trip out to the Dakota Badlands and Black Hills, a jaw-dropping part of the country that I often find myself dreaming of. I spent days at Devil’s Tower National Monument, Wind Cave, Badlands and Theodore Roosevelt National Parks. All five places above required me to limit myself to the amount of superlatives I used to describe their sheer amazingness. When I was at Theodore Roosevelt National Park, I spent a full-day hiking in the Northern Unit of the park, just twenty-miles shy of Watford City, North Dakota. This region of the national park is much quieter, remote and sees way less visitors. All three pre-requisites I envy for. The northern section of the park is also home to the Theodore Roosevelt Wilderness, a primitive wilderness area in the national park. When I was hiking, I saw a big bull (male bison) grazing (which they do up to 11 hours a day!) off in the distance, probably if I had to guess maybe 15 minutes away. Close enough to be cautious yet far away enough to continue on. The path I was on, the Buckhorn Trail, took me farther away from the bison, so I kept on trekking. Going into the hike, I was aware that yes, there would be wild buffalo hanging around as it’s their home. Cool, I didn’t have any intention of bothering any of them or encroaching on their turf too closely. They’re majestic animals that I adore. I’d rather observe them from a safe distance and let them roam free than end up like one of the many foolish tourists who purposely provoke or take selfies with them and end up getting seriously injured or killed. Idiots. But sir buffalo didn’t seem to particularly agree with my presence, even from afar. I looked over my shoulder about ten minutes later and saw he was walking towards me at a moderate pace. I continued pressing forward along the trail. Minutes later, I glanced again and he was even closer. “Cool. I’m getting stalked by a massive bison. I’ll just keep on walking away from it and not bother him,” I thought. The situation grew more serious. When I crossed through a small gulch through the Squaw Creek and climbed to the top, I turned around and he was only probably 30 feet behind me at the top of the other side I had just gone down. We made eye contact and in a flash of a second, he charged. Grunting and running towards me at full-speed down and up the gulch. I panicked on the inside and took off running for my life. I remember just hearing grunts and heavy clambering of his feet on the dusty ground. I found a branchy juniper tree and crawled as far into it as I can, getting scratches all over my arms. 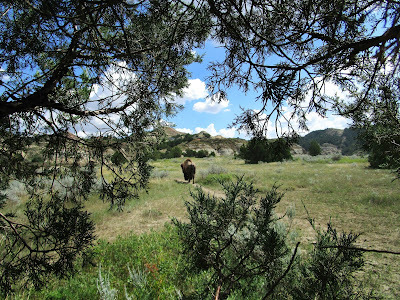 The bison ran past the tree and down the trail, while I cowered in the juniper waiting. I happened to have my camera in my hand while running so as soon as I hid in the juniper, I was lucky to snap a photo of him running by. I remained crouched there, for probably ten minutes after he ran by. 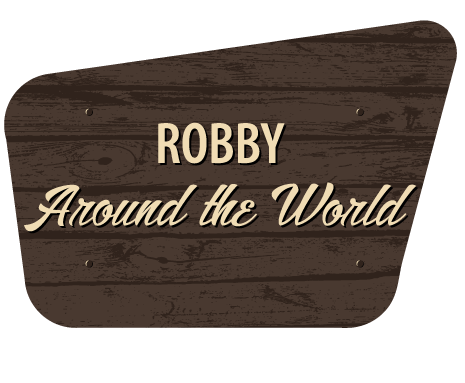 Patience Robby, breathe, breathe, compose yourself. My heart was racing at a million-beats each minute. I just thought back to when I lived out in Colorado, where they told us that the best way to survive a moose charge (and I saw plenty of them on guided snowshoe hikes I led with families) is to put yourself between it and a tree, so I hoped that would be the similar solution with said bison. I would think this could work during the majority of bison charges if there are good trees around… but they’re crazy fast and agile… and if they do get to you- you’re getting hurled up high in the air, gorged or trampled. Cover your essentials if this is your fate. Was I scared? Oh hell yes, it was absolutely alarming. But it was just, just, just mind-blowing to see a giant, wild animal jump into a sprint. So let me put some numbers on paper real quick…a bison can run more than 40mph, can jump up to six-feet vertically and weigh between 1,000 and 2,000 pounds than. Some are also taller than I am, and I’m 6’2. a I’m a big fan of bison, they’re my favorite animal and recently, the Department of the Interior agreed. As of May 2016, the bison is now our National Mammal! Yeah! America! P.S. you know what’s really funny to watch? When a buffalo rolls around in a crater of dirt to help shed some its thick fur coat and thwart off some flies. It’s called wallowing. 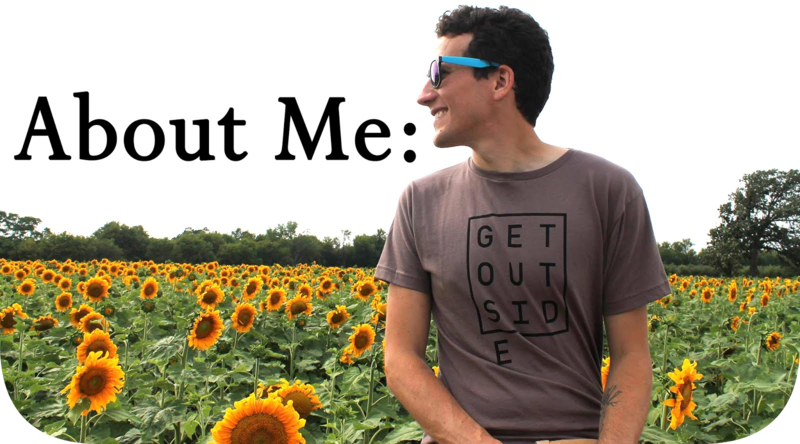 Want to learn some even more rad facts about bison? Check out this list from the U.S. Department of the Interior’s blog. There’s something intriguing and moving about seeing buffalo in their natural habitat. They’re strong, bold animals with an unstoppable amount of power. I feel like I could just sit and watch them for hours, well…I kind of did that when I was at Badlands National Park a few months ago and it was like a dream. You should probably do that too.